Phytonutrients, also known as phytochemicals, are plant-based compounds or chemicals that have a beneficial effect on the body and may play a role in the prevention and even treatment of disease. While it's thought that there are tens of thousands of these phytochemicals, only a small number have been isolated and tested. Including classes such as carotenoids, flavonoids, isothiocyanates, and much more, these nutrients can have effects that range from antioxidants to anti-inflammatory agents, and properties that may be neuroprotective, provide immune support, regulate hormones, and much more. We will take a look at exactly what phytonutrients are, their beneficial effects in prevention and disease, some of the major classes and examples, and then share tips on how to enrich your diet with these preventive substances. In general, more is better when it comes to phytochemicals, but we will also discuss precautions for those who have thyroid disease, and why phytonutrients should be obtained primarily via diet rather than supplements. Phytonutrients are different than vitamins, minerals, and macronutrients such as proteins, carbohydrates, and fats. They are found not only in fruits and vegetables, but in many spices, and even edible flowers. Many of these phytochemicals give the foods their color or smell. Foods containing phytochemicals are often very colorful, but white foods such as onions and garlic, and even olive oil are high in these nutrients as well. As far as function, these nutrients can be thought of as part of the plants "immune system," as they offer protection against viruses, bacteria, fungi, and parasites. Some phytochemicals function as antioxidants or "scavengers" in the body. Free radicals are unstable and very reactive molecules that are produced by toxins (carcinogens) in the environment, as well as normal metabolic processes in the body. Left alone, free radicals can damage DNA and other components of cells. (Oxidative damage to DNA and subsequent mutations are a precursor to cancer and many other conditions.) Antioxidants neutralize these free radicals, preventing the damage they could cause. Many phytonutrients can reduce inflammation in the body. While inflammation is the body's natural response to damage, chronic inflammation has been linked with many medical conditions ranging from connective tissue diseases to cancer. Some phytonutrients support immune system function and can have specific effects. For example, some phytochemicals act as anti-microbial agents, reducing the chance that pathologic (bad) bacteria or viruses will divide and grow in the body. They may also help to modulate the immune system, helping to maintain the very delicate balance between an overactive immune system (that can lead to autoimmune diseases) and an underactive immune system (that can predispose to infections or cancer). Recent studies have found evidence of neuroprotective effects with some phytonutrients in people who have conditions such as Alzheimer's disease and Parkinson's disease. Some phytonutrients may prevent substances in food or the environment from becoming carcinogens (cancer-causing agents) in the first place. In addition to the functions above, some phytochemicals can help in DNA repair (repairing mutated genes that can lead to cancer), slow the growth of tumors, or facilitate apoptosis (the process of cell death that gets rid of abnormal cells). A 2018 review found that phytochemicals have an important role in the prevention of skin cancers (both melanoma and non-melanoma cancers). A few of the beneficial nutrients included curcumin (a component of turmeric), proanthocyanidins (found in berries and pistachios), and capsaicin (found in sweet red and chili peppers). In a sense, your diet may actually be a form of sunscreen. Some phytonutrients can regulate hormones such as estrogen and insulin. A number of phytochemicals have demonstrated possible anti-aging effects in at least a few clinical trials, and through several different mechanisms. Some of the more common include resveratrol, epicatechin, quercetin, curcumin, and allicin. While most research has focused on the ability of phytonutrients to maintain health or prevent disease, researchers are now trying to determine if phytochemicals may have a role in treating the disease as well. As such, these compounds could provide a much less expensive adjunct to treatment with fewer side effects than traditional therapies. While the research is young, early studies (often done on cells grown in the lab or on animals, but in some cases conducted on humans) has found that some phytochemicals that may help fight cancer, such as such as phloretin in pears, epigallocatechin-3-gallate (EGCG) in green tea, and quercetin in capers. Other foods may help fight heart disease, such as such as the flavonoids in berries. Other potential effects are just beginning to be evaluated. For example, scientists are looking at the ability of some phytochemicals to sensitize breast cancer cells to treatment, and much more. Phytonutrients can be thought of as "bioactive food components," as their biological activities in the human body play a role in health. Classification can be confusing, as the major classes are based on chemical structure. More commonly, these compounds are broken down into phytonutrient groups. The following list is not comprehensive but includes several of the phytonutrients that should be included in a "rainbow diet" as discussed below. Polyphenols are a category of phytonutrients that includes at least 500 known (and likely many yet to be discovered) compounds. Many of these compounds are antioxidants, and together these nutrients are thought to reduce the risk of a large number of diseases. They are broken down into flavonoids, non-flavonoids, and phenolic acids. Anthocyanidins: Providing the rich color in red, blue, and purple berries, anthocyanidins are powerful antioxidants. Proanthocyanidins: Also called pycnogenols, these plant chemicals found in the grape seeds, grape skins, and cranberries may help reduce the risk of heart disease in addition to their antioxidant properties. Resveratrol: Popularized as the phytonutrient in red wine that may reduce the risk of heart disease, resveratrol can also be found in red grape juice, red grapes, and more. Flavones: Including phytochemicals such as luteolin and apigenin, flavones are found in many spices (see below). Catechins (such as epicatechin): Present in green tea and more, catechins are one of the phytonutrients being evaluated for their anti-aging properties. Terpenoids are broken down into both carotenoid and non-carotenoid phytochemicals. Carotenoids are plant pigments that are related to vitamin A, but antioxidant and immune system effects. Some of these may inhibit tumor growth. Lycopene: Found in highest concentration in cooked tomato products (think: spaghetti sauce as heating results in better absorption of lycopene), foods high in lutein also include fresh tomatoes, watermelon, and more. Researchers have been studying lycopene for its possible role in reducing the risk of prostate cancer. Lutein: Found in leafy greens, kiwi, egg yolk. and more, lutein has been linked with a lower risk of macular degeneration (the leading cause of blindness in the United States), and may be of benefit in relieving eye symptoms related to computer use. Thiols include several types of phytonutrients that have anti-cancer properties and may block carcinogens that are introduced into the body. Isothiocyanates, such as sulforaphane: Sulforaphane is found in cruciferous vegetables such as broccoli, cabbage, cauliflower, radishes, and much more, and has powerful antioxidant properties. It's clear that adding a healthy variety of phytonutrients to your diet can have many benefits, but many people wonder where to start. After all, it would be cumbersome to stand in the produce section of your market with a list such as that above. Yet there are relatively simple ways to make sure you get what you need from the currently recommended minimum of five, and up to thirteen servings of fruits and vegetables daily. Eating a "rainbow" of foods is one of the easiest ways to make sure you are getting a wide variety of phytonutrients with many benefits. While many of these components are healthy in their own right, it's the combination of nutrients that is optimal (think: the sounds of an orchestra rather than a single instrument). Various families of plant colors tend to contain similar nutrients, for example, orange foods tend to have the carotenoid group. Eating a rainbow allows people to get the best of phytonutrients as their different colors offer up different health benefits. For example, the lycopene in tomatoes and pink grapefruit, the anthocyanins in blue and purple berries, and the flavonoids in chocolate are all examples of beneficial phytonutrients that function differently. Here are five of the colors of phytonutrients and some of the functions associated with each. Supports prostate, urinary tract, and DNA health. Protective effect against cancer and heart disease. Some phytonutrients represented include lycopene, ellagic acid, quercetin, hesperidin, anthocyanidins. Good for your heart, brain, bone, arteries, and cognitive health. Phytonutrients include resveratrol, anthocyanins, phenolics, and flavonoids. Supports eye health, arterial function, liver function, and cell health. Some phytochemicals found in green foods include epicatechins, isothiocyanate, lutein, zeaxanthin, isoflavones, flavonoids, and coumestans. Supports healthy bones and circulatory system and may help reduce the risk or fight heart disease and cancer. Phytochemicals in these foods include allicin, quercetin, indoles, and glucosinolates. Promotes healthy growth and development and good eye health. Phytochemicals common in yellow and orange foods include alpha-carotene, beta-carotene, beta-cryptoxanthin, lutein/zeaxanthin, and hesperidin. We tend to focus on foods when talking about nutrition, but many spices and even flowers can add flavor and a healthy dose of phytonutrients to your diet with few calories. A few examples of phytonutrients in spices include luteolin (found in oregano, sage, thyme, and celery seed), and apigen, found in parsley. While the science is young, maximizing your intake of phytonutrients may be one reason to choose organic foods when possible. While most often we think of organic foods as being healthier due to less pesticide residue, there may be other benefits. Earlier we talked about phytonutrients as playing a role in a plants immune system. By protecting plants from invasion by microbes (by using pesticides), we may actually be keeping them from producing as many phytochemicals. An example is the 2017 study published in the Journal of Agricultural and Food Chemistry. In this study, it was found that onions that were grown under organic conditions had greater antioxidant activity, as well a greater concentration of flavonols and quercetin. We won't know the full story for some time, but for those who try to choose organic foods, this thought may help justify some of the increased cost. In addition to aiming for a rainbow of foods, a few strategies may help you maximize the phytonutrients you and your children consume. Keep a photo of fruits and vegetables around the kitchen. Research shows that merely being around pictures of fruits and vegetables can increase your intake of the foods. Consider keeping a chart on the refrigerator that reminds you and your children of the "colors" you have eaten, and those you still need to eat each day. Become creative when preparing foods. Salads can be "doctored" to include a wide array of colors, and hence phytochemicals. Add berries, veggies, avocados, chia seeds, and more. Try "hiding" a serving or two of veggies in your main dishes. Foods such as cauliflower are easily hidden in spaghetti sauces, chili, and soups. Better yet, skip the spaghetti noodles and try zucchini or spaghetti squash "noodles." In general, a diet higher in phytochemicals, especially a variety of these compounds, can mean better health. But it's important to remember that too much of a good food is not necessarily better. An excess of one "good" food may actually lead to a deficiency of the phytonutrients in another. For those who have thyroid disease or are at risk for thyroid disease, it's important to point out that many of the healthiest foods with regard to phytochemical content also contain goitrogens, substances that have an anti-thyroid effect. Foods (such as broccoli that is rich in sulforaphane) that are goitrogens can still be eaten but should be spaced out throughout the day. Eating some of these foods steamed rather than raw can also reduce the goitrogen content. Despite the multitude of studies that have found a diet rich in fruits and vegetables to be beneficial in overall health, we have yet to obtain the same benefits from supplements of the phytonutrients contained therein. In contrast, some supplements may have the opposite effect. A classic example occurred with the risk of lung cancer. Upon noting that people who ate foods high in beta-carotene had a significantly lower risk of developing lung cancer, researchers set out to see if supplements of beta-carotene would have the same effect. Not only did the supplement form of beta-carotene not reduce risk, but people who used beta-carotene supplements had a significantly higher risk of developing the disease. Phytonutrients or phytochemicals clearly play an important role in maintaining health and preventing disease. Rather than focusing on specific phytonutrients, however, the greatest health benefits likely come from eating a wide variety of these nutrients. After all, many of the benefits we receive from eating a wide variety of colorful fruits and vegetables may come from phytonutrients that are yet to be discovered. Ng, C., Yen, H., Hsiao, H., and S. Su. Phytochemicals in Skin Cancer Prevention and Treatment: An Updated Review. International Journal of Molecular Sciences. 2018. 19(4).pii:E941. Ren, F., Reilly, K., Kerry, J. et al. Higher Antioxidant Activity, Total Flavonols, and Specific Quercetin Glucosides in Two Different Onion (Allium cepa L.) Varieties Grown Under Organic Production: Results From a 6-Year Field Study. Journal of Agricultural and Food Chemistry. 2017. 65(25):5122-5132. Velmurugan, B., Rathinasamy, B., Lohanathan, B., Thiyagarajan, V., and C. Weng. Neuroprotective Role of Phytochemicals. Molecules. 2018. 23(10):2485. Hongwei, S., and L. Dongmin. Dietary Antiaging Phytochemicals and Mechanisms Associated with Prolonged Survival. Journal of Nutritional Biochemistry. 2014. 25(6):581-591. 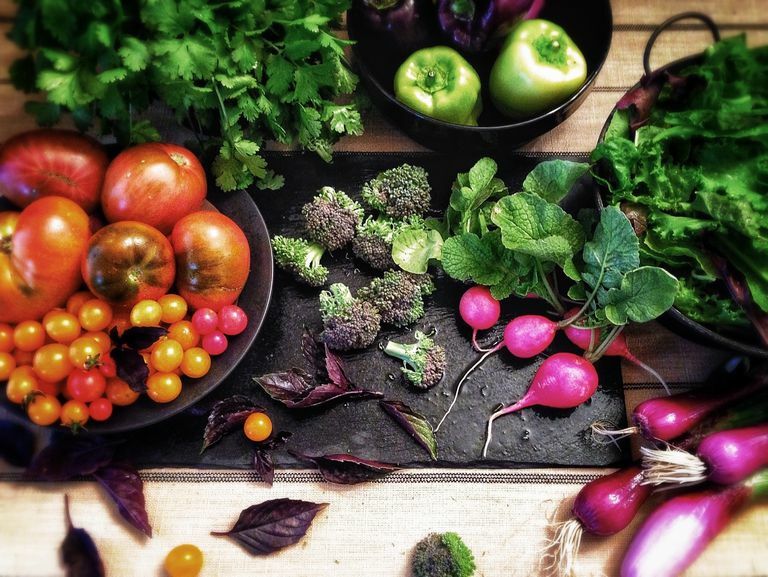 How Does Eating Phytochemicals Keep You Healthy?